1. Check that the 12 volt battery terminalsare tight and clean. 2. If the 12 volt battery terminals areO.K., the 12 volt battery is discharged.You may try jump starting. See “(b)Jump starting” for further instructions. Hybrid vehicles cannot be push−started. The hybrid vehicle system is suspected tobe faulty. Contact your Toyota dealer. If the 12 volt battery is discharged, thehybrid system can be started by jumpstarting. Depending on the vehicle condition,the engine may not start. To avoid serious personal injury anddamage to your vehicle which might resultfrom battery explosion, acid burns,electrical burns, or damaged electroniccomponents, these instructions must befollowed precisely. If the 12 volt battery is discharged, youcannot access to the 12 volt battery in theluggage compartment because the backdoor cannot be opened. 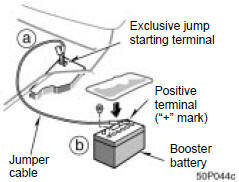 Use the exclusivejump starting terminal in the enginecompartment. For details, see “JUMPSTARTING PROCEDURE” on page 361. If the 12 volt battery is dischargedwith the transaxle in “P”, your vehiclecannot be moved unless the frontwheels are raised. This is because thefront wheels are locked by means ofthe parking lock mechanism. If you are unsure about how to follow thisprocedure, we strongly recommend thatyou seek the help of a competent qualifiedtechnician or towing service. Booster battery contains sulfuricacid which is poisonous and corrosive.Wear protective safety glasseswhen jump starting, and avoid spillingacid on your skin, clothing, orvehicle. If you should accidentally get acidon yourself or in your eyes, removeany contaminated clothing and flushthe affected area with water immediately.Then get immediate medicalattention. If possible, continue toapply water with a sponge or clothwhile en route to the medical office. The gas normally produced by abattery will explode if a flame orspark is brought near. Use onlystandardized jumper cables and donot smoke or light a match whilejump starting. The battery used for boosting mustbe 12 V. Do not jump start unlessyou are sure that the booster batteryis correct. After jump starting procedure, thehybrid system may not start bypushing the “POWER” switch. Inthat case, push it once again. If the“READY” light does not come on,contact your Toyota dealer. 1. Apply the parking brake and turn offthe headlight switch and interior light. 2. Turn off the hybrid system and removethe key if inserted. 3. Open the hood and fuse block covershown in the above illustration. 4. 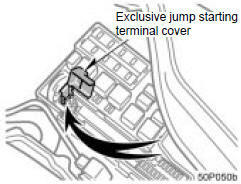 Open the exclusive jump starting terminalcover. 5. If the booster battery is installed inanother vehicle, make sure the vehiclesare not touching. Turn off allunnecessary lights and accessories.When boosting, use the battery ofmatching or higher quality. Any otherbattery may be difficult to jump startwith. If jump starting is difficult, chargethe battery for several minutes. 7. If the engine in the vehicle with thebooster battery is not running, start itand let it run for a few minutes. Duringjump starting, run the engine at about2000 rpm with the accelerator pedallightly depressed. 8. Connect the jumper cables in the ordera, b, c, d.
a. Connect the clamp of the positive(red) jumper cable to the exclusivejump starting terminal. b. Connect the clamp at the other endof the positive (red) jumper cable tothe positive (+) terminal on thebooster battery. 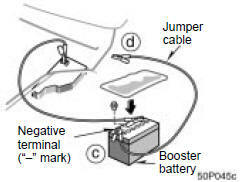 c. Connect the clamp of the negative(black) jumper cable to the negative(–) terminal on the booster battery. d. Connect the clamp at the other endof the negative (black) jumper cableto a solid, stationary, unpainted, metallicpoint of the vehicle with thedischarged battery. When making the connections, toavoid serious injury, do not lean overthe battery or accidentally let thejumper cables or clamps touch anythingexcept the correct battery terminalsor the ground. 9. Charge the discharged battery with thejumper cables connected for approximately5 minutes. At this time, run theengine in the vehicle with the boosterbattery at about 2000 rpm with the acceleratorpedal lightly depressed. 10. Start the hybrid system. Make sure the“READY” light is on. If the hybrid batterywarning light comes on in the multi−information display, the hybrid batteryis also discharged. Contact your Toyotadealer. 11. Carefully disconnect the cables in theexact reverse order: the negative cableand then the positive cable. 12. Carefully dispose of the battery covercloths—they may now contain sulfuricacid. 13. If removed, replace all the battery ventplugs. If the cause of your 12 volt battery dischargingis not apparent (for example,lights left on), you should have it checkedat your Toyota dealer. Check that the clamp on the jumpercables are tight. Recharge the dischargedbattery with the jumper cables connectedfor several minutes and restart your hybridsystem in the normal way. If the another attempt is not successful,the battery may be depleted. Have itchecked at your Toyota dealer.